The 2008 Rails Rumble, a competition for Ruby on Rails coders, saw 131 web applications launch into the wild this past weekend. The quality of the applications increased dramatically this year, turning the competition into something of a startup hyper-incubator, with the goal of producing apps that not only win votes but become sustained products. The rules are simple: you, along with up to three hacker friends, can’t start coding until midnight on Friday and you must finish by midnight on Sunday. All code is loaded into private GitHub repositories and all apps are deployed onto Linode virtual servers (both of which are provided for free by sponsors). And as the weekend draws to an end, your (hopefully) functional app will become frozen for testing and voting by anyone on the net. The apps that dominated this year’s Rumble (the second ever held) relied a lot less on developing their own “network effect” than last year’s. Many were built around Twitter, and there were a number of project collaboration apps as well. The participants were also significantly more professional and thrived on the pressure to get a real product off the ground. Around five apps out of 90 total from the 2007 competition are still around today, including last year’s winner Tasty Planner. The Rails Rumble team, a volunteer organizing committee led by Nick Plante and Darcy Laycock, expects that number to grow significantly this year. 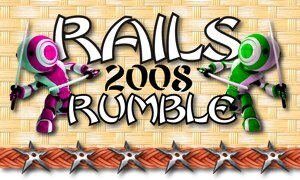 While the 2008 Rumble was Rails-specific, Plante hopes to host more events and potentially different types of competitions. He says the behind-the-scenes work done this year was primarily concerned with building “a turn-key solution for hosting a coding competition,” including registration and voting infrastructure. This year’s competition also made a big push for OpenID; it was not only required for registration and voting, approximately 95% of competition apps integrated the standard as well. Last year: 324 participants on 140 teams. 90 teams qualified (successfully created an app). This year: 529 total participants on 231 teams. 131 teams qualified. 14355 total commits to GitHub (avg 112 per team). Want to get involved? Voting for 2008 Rails Rumble begins now. Here’s how it works: signup to vote and get 10 random app invitations. If you cast votes, you’ll receive 10 more, and so on. Winners of this year’s Rumble will get (among lesser prizes) a mint-condition 1986 Chuck Norris Undercover Agent Action Figure (“Chuck Norris does not sleep…He waits”). So check out some of these apps, vote, and let us know what you think in the comments.